Medieval Cheese Board - Moar Stuff - You don't need it but you know you want it. Whether you like to pretend that your cheese embodies your mortal enemies, or you just like to play executioner de fromage, this Medieval Cheese Board sets the scene. 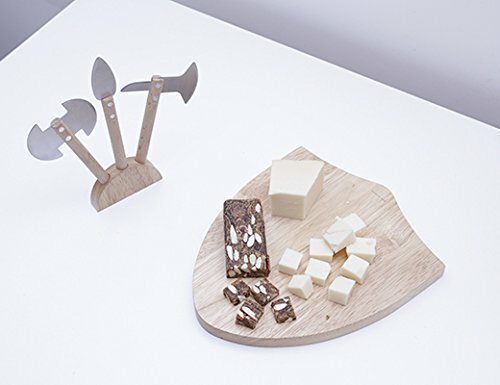 The Medieval Cheese Board set is the perfect way to go medieval on your cheese and hors d’oeuvres. It let’s you play the executioner de fromage anytime you like. 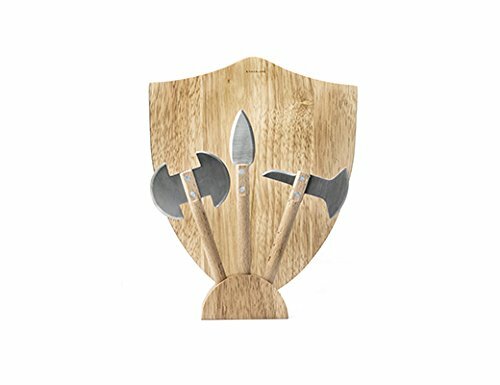 The included axe and spear shaped utensils feature 420 stainless steel blades and beechwood handles. 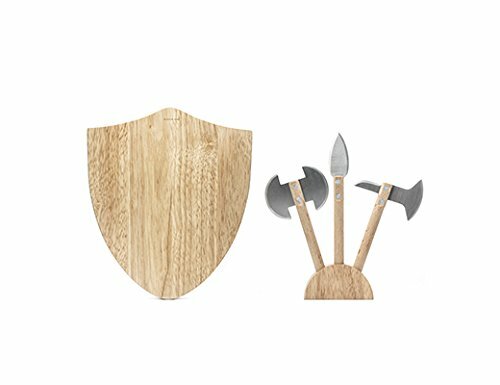 The shield-shaped rubberwood chopping board will handle any de brie you have left after your feast. It’s so gouda, your next wine and cheese event may take a decidedly feudal turn. This cheese board set is well made and can handle even the hardest cheeses. So, set out a selection of soft, semi-soft, and hard cheeses. Include some fruit, bread, and crackers, and let the axe fall where it may. Literally, in this case. Dimensions: 10 1/2″ x 9″ x 3/4″ thick. Materials: 420 stainless steel blades with beechwood handles, chopping board is rubberwood. Care Instructions: Rinse and wipe clean with damp cloth. Do not soak in water. Periodically treat with a good chopping block oil. If you don’t have any of that laying around, you can use some food-grade mineral oil.